A sci-fi third-person shooter, featuring unique dual light-gun controls, online team deathmatches, and destructible urban environments, from Byking, Taito, and Square Enix. Released for the Taito Type X3 arcade system in 2012, it began the Gunslinger Stratos franchise of games and anime. 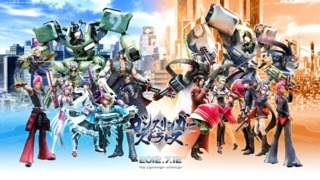 Gunslinger Stratos is a third-person shooter with unique dual-wielding light-gun controls, featuring two gun controllers that can be fired separately or combined together into one or more powerful weapons. The light-guns also feature an analog stick to control the character movements along with buttons to jump and fly. It is a multiplayer video game that can be played with up to eight players offline or more players online. Players can play up to 4 vs 4 team deathmatch modes, in realistic, fully destructible, urban environments modelled after actual cities in Japan. The characters are based on a range of anime and manga archetypes, from the teenage schoolgirl to the giant mech. The game features hundreds of different guns which can be purchased using a point system and can save data using a NESiCA card. The game was developed by Byking and Bee Tribe, using Silicon Studio's Orochi Engine. It uses the Yebis post-processing effects middleware, along with the Havok physics middleware. The game could render over 4 million polygons per scene, the highest in video games up until 2012, the same as Dead Rising and Halo: Reach and more than Crysis. At 60 frames per second, Gunslinger Stratos could render over 240 million polygons per second. The scenario was written by Norimitsu Kaihō of Nitroplus, while the CGI cutscenes were rendered by Square Visual Works. It runs on the Taito Type X3 arcade system, which is comparable in power to Sega's RingEdge 2 (released 2012) arcade system as well as the PS4 and Xbox One consoles (released 2013). The Type X3 runs HD 1080p resolution at 60 frames per second, or 1440p resolution, on a 60-inch plasma display. At 60 frames per second, the Taito Type X3 hardware could render Gunslinger Stratos at over 240 million polygons per second. The game received an update in 2013, adding a new character called Srinivasa, a blind musician from India who uses ultrasonic technology to see. The game made its American debut at the Game Developers Conference in March 2013, temporarily released by Silicon Studio to demonstrate their Yebis middleware which the game utilizes. The game did not receive a nationwide release there. The success of Gunslinger Stratos has inspired an anime adaptation, which was previewed in 2013. It will begin airing in 2015. A sequel, Gunslinger Stratos 2, has been released in early 2014, following a location test in late 2013. It will be followed by Gunslinger Stratos Reloaded for PC in 2015. The new Dissidia: Final Fantasy game for arcades will use a similar gameplay engine to Gunslinger Stratos. Square Enix's arcade game School of Ragnarok also features similar gameplay.